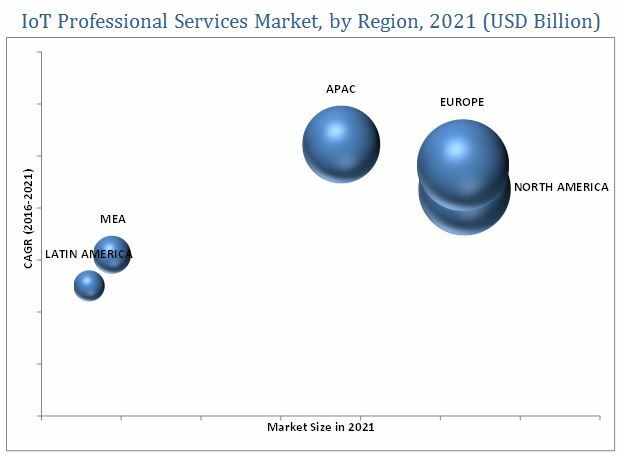 [147 Pages Report] The Internet of Things (IoT) professional services market is estimated to grow from USD 57.18 billion in 2016 to USD 158.28 billion by 2021, at a Compound Annual Growth Rate (CAGR) of 22.6% during the period 2016–2021. IoT professional services is a portfolio of services and capabilities that help in the elimination of implementation of complex IoT business models. It defines an appropriate strategy for businesses for digital transformation and empowers them to bring together the right mix of IoT products and solutions. The complexity involved during the integration of IoT technology with the existing legacy systems and process is the major pain point of the organizations planning for a digital transformation. The base year considered for the study is 2015, and the forecast has been provided for the period between 2016 and 2021. The working in the industrial and the transport sectors has been enhanced with the implementation of the IoT technology solutions. The trend is more matured in the developed economies and offers potential business opportunities in the developing regions. However, the business models and the operational process of these two sectors are highly complex and cannot be addressed without specialized expertise. Hence, there is a growing demand across these sectors for specialized IoT services which would address their challenge of digital transformation without affecting the business model. The IoT professional services ecosystem include technology vendors such as Accenture PLC (Dublin, Ireland), Atos SE (Besons, France), Capgemini S.A. (Paris, France), Cognizant Technology Solutions Corporation (New Jersey, U.S.), IBM Corporation (New York, U.S.), Infosys Limited (Karnataka, India), NTT DATA Corporation (Tokyo, Japan), Tata Consultancy Services Limited (Maharashtra, India), and Tech Mahindra Limited (Maharashtra, India), Wipro Limited (Karnataka, India), which provide numerous IT and non-IT components required for IoT professional services. What are the hot application areas for IoT professional services? The IoT professional services market size is expected to grow from USD 57.18 billion in 2016 to USD 158.28 billion by 2021, at a Compound Annual Growth Rate (CAGR) of 22.6% during the period 2016–2021. The major drivers for upsurge in demand for IoT professional services market include rising trend of adopting IoT professional services to reduce Capital Expenditure (CAPEX) and Operational Expenditure (OPEX), demand for highly customized IoT services in the industrial and transportation sector, and increasing adoption of digital transformation services in organization by opting specialized IoT business and technology consulting services. 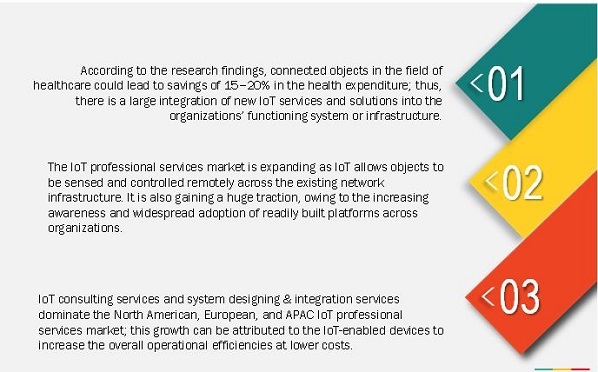 The scope of this report covers the IoT professional services market analysis by services, applications, and regions. The system designing and integration services is expected to grow at the highest CAGR during the forecast period. These services support the design and implementation of IoT solutions across enterprises. The service providers deploy the latest IoT technology to improve the operational performance and gain a smarter enterprise. IoT consulting services is expected to have the highest market share in the IoT professional services market. The consulting services team ensure interoperability and develop & implement the right IoT applications and architecture for the business or clients. The key benefits of IoT technology consulting services include better align technology to the organization's needs, realize business benefits in a timely fashion, reduce costs of compliance & risk management, security concerns, sketch an infrastructure plan, and enhance the internal functionality. The growth of IoT consulting services is attributed to the increase in the adoption of the technology, connected devices, and automation. As per the geographic analysis, North America is expected to have the largest market share. It is likely to benefit from its technological advancements and followed by robust internet infrastructure, widespread adoption of new technology, and presence of a strong domestic solution providers have all contributed to the shifting towards smart infrastructure from conventional infrastructure. The need for better operational efficiency and business process at a low operating cost is expected to drive continuous growth in the IoT professional services market. The smart transport and logistics segment is all about integrating advanced technologies with the existing transportation and logistics infrastructure, delivering real-time online information about the traffic flow, tracking of the assets, and passengers/commuters. With regards to the consulting services, the companies offer business operation, technical management, change management, transformation, and people management. The smart manufacturing segment includes network management, data management, security solutions, and remote monitoring. In the pre-deployment phase, the consulting services help the organization in creating a new IoT infrastructure to enhance its existing system and also to achieve strategic business goals. The service providers are also keen to sketch intelligent designs of machines and production to improve the manufacturing processes and applications to attain the higher economy of scale. The smart energy sector observes large complications during its production; the professional services ensure the right deployment of the technology to improve the working efficiency and effectiveness, and the service providers also design the entire IoT infrastructure to enhance productivity, business processes, security, and profitability. In compliance with the changing regulatory requirements and increasing environmental pressures, IoT professional services are used to transform the business operations. The connected devices enable the healthcare organizations to streamline the operations, business processes, and aid in real-time patient care, even from remote locations. IoT professional services provide in-depth knowledge about the benefits and features that the new service would offer their patients and caretakers. The healthcare industry involves sensitive information; the consulting services regarding security could hamper the growth of IoT in the healthcare industry. A few of the restraining factors that affect the growth of the market include slow growth rate in the initial period of market forecast and limited availability of technically skilled personnel. The IoT professional services vendors profiled in the report include Accenture PLC (Dublin, Ireland), Atos SE (Besons, France), Capgemini S.A. (Paris, France), Cognizant Technology Solutions Corporation ( New Jersey, U.S.), IBM Corporation (New York, U.S.), Infosys Limited (Karnataka, India), NTT DATA Corporation (Tokyo, Japan), Tata Consultancy Services Limited (Maharashtra, India), Tech Mahindra Limited (Maharashtra, India), and Wipro Limited (Karnataka, India).